Eating bran cereal for breakfast can greatly assist weight control because it has a high faecal bulking effect, making you feel fuller, reducing the transit time of faeces through the gut and reducing fat absorption. 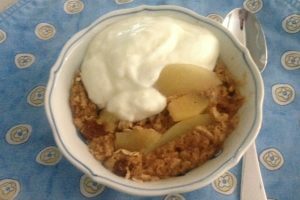 This breakfast can be eaten hot or cold but this recipe reminds me of apple crumble. It is also great with rhubarb, tamarillos, plums or Lea’s summer fruit combo..
Each serving contains: Energy 786kJ/187kcals, Protein 10g; Fat 2.6g, Saturated fat 0.6g, Dietary fibre 9.7g, Carbohydrate 30g, Sodium 305mg.